Animal activity is defined as nocturnal (nighttime), crepuscular (twilight—early morning and late evening), or diurnal (daytime). Hedgehogs are typically described as nocturnal or crepuscular. Most pet hedgehogs sleep during the day, only coming out for an occasional snack or drink. Our article Are Hedgehogs Nocturnal, Crepuscular, or Diurnal? describes this topic in great detail, with many sources and opinions provided. Almost all hedgehog activity at our place occurs when we turn off the lights for the night. We feed all our animals in the morning. Many hedgehogs come out to greet us and have snacks, but all quickly return to their slumber. Throughout the day, hedgehogs may get up to have a drink or a bite to eat, or use the litter pan, but for the most part, they are not very active in the daytime. Cage-cleaning days, weaning days, and days when we rotate our breeding animals are quite active. The hedgehogs love to explore their clean cages and then usually go right back to sleep. You may think your hedgehog just sleeps all the time, but most likely it is active when you are not. Customers frequently ask questions about and comment on their hedgehogs’ lack of daytime activity or their “laziness” and wonder if this is normal hedgehog behavior. Though they sleep all day, hedgehogs are not lazy. Daytime sleeping is completely normal for nocturnal and crepuscular animals. Baby hedgehogs sleep quite a bit, and they have a tendency to sleep more after the stress and activity of going to a new home. The need for additional sleep is common in both human and animal babies. The main indicators of health and comfort are adequate levels of eating and drinking, which can be monitored by stool quantity and quality. An average hedgehog does not mind daytime handling as long as it is given sufficient time to fully wake up. People often expect an immediate positive response to being picked up. Be sure to give your hedgehog plenty of time to “get the sleep out of its eyes” before you attempt to pet or handle it. Hedgehogs should be gradually acclimated to daytime activity through routine handling and feeding earlier in the day. Some hedgehogs may accept this change more readily than others. You can expect your hedgehog to interact with you when you are handling it or when you put it in a stimulating environment. However, when you return your hedgehog to its cage, it is likely to return to sleep. Hedgehogs may enjoy being awakened or handled at specific times. No studies have been done concerning the long-term health effects (if any) of adapting a nocturnal or crepuscular animal to a diurnal schedule. Problems resulting from suddenly changing circadian rhythms in humans include insomnia and jet lag. It is recommended to change biological rhythms slowly over an extended period of time. Different hedgehogs will tolerate different amounts of daytime handling. Some hedgehogs may tolerate short amounts of daytime play, while others may continue to play for several hours. Signs of a hedgehog ready to go back to sleep are frantic searching for a place to hide, sitting still, or appearing stressed in any other way. Your hedgehog may bite out of frustration if you are not paying attention to its signals. Some hedgehogs thrive on excursions outside their typical settings. Excursions might include educational visits to classrooms. Hedgehogs may eat, play, or wheel in full view of the public when their cages are big enough (versus small travel carriers). Some hedgehogs seem to enjoy outings; do not huff, puff, or ball up, and are perfectly behaved in the company of strangers. Unusual Daytime Activity—Is This Normal? Sometimes hedgehogs exhibit daytime activity without being awakened by their human companions. Babies are most likely to exhibit unusual activity, especially when they are acclimating to a new cage or a new home away from siblings. Peanut is quite well behaved, but the weird thing is he is more sociable in the day than at night. He is supposed to be sleeping in the day when he is in my room upstairs, where it is quiet, but sometimes in the middle of the day he will come out of his cage and grab a bite to eat, take a sip of water, and then go on his wheel or play with his toys for like 5 minutes, and then return back to sleep. It is strange, which makes me wonder if in the nighttime he takes tiny naps because of the 5 minutes of sleep that he lost in the day. He is some fun to watch and he is my special little guy. Every hedgehog has a different personality, I guess (and schedule). Millermeade Farms’ customer McCayla reported that her recently purchased hedgehog is typically up in the morning at 8:00 a.m. and stays awake until 3:00 p.m. It then sleeps in the evening and all night long. Adult hedgehogs that exhibit unusual daytime activity should be evaluated for any other unusual behaviors. Behaviors or changes besides unusual activity may indicate that something may be physically wrong with your hedgehog or that something in the environment has changed. When food intake and output, weight, body temperature, and cage temperature all appear to be normal, the change in schedule is likely just the hedgehog’s choice. Some hedgehogs may suddenly use their wheels less. Hedgehogs who decrease their wheel use may gain weight. Extra time out of the cage may help to increase activity levels in these hedgehogs. Has the hedgehog outgrown its wheel? What is the temperature? Is it within the 75° to 80° temperature range? Older hedgehogs may require slightly higher temperatures. Do the nails need clipped or trimmed? Are there any other gait problems? Has the hedgehog’s mood changed? A visit to the veterinarian is in order if you observe any changes other than activity level. The best way to monitor your hedgehog’s health and activity level is to keep a journal or log of its weight, food intake, and behavior. Many breeders and hedgehog enthusiasts use a kitchen scale (that measures in grams) to weigh their hedgehogs and track weight gain and loss. It is a good idea to weigh your hedgehog the same time every day to get the most accurate measurement and to avoid weight fluctuation at feeding time. Food intake is often directly related to weight gain or loss, so it is important to note any changes in food consumption. Writing down your hedgehog’s daily activity may provide a clear picture when behavior changes and help to determine what is normal or abnormal for each animal. I am considering getting a hedgehog for my wife for Christmas. She works from home and is interested in getting a pet to keep her company during the day. One of her friends has a hedgehog, so she was intrigued by that idea. Do hedgehogs get up and run around during the day, or do they truly just sleep in their cages? That doesn’t necessarily seem to be the best fit if my wife wants a pet she can hang out with during the day. You are correct. Without interaction hedgehogs will sleep all day as that is part of their nocturnal nature. It depends on what you consider “hanging out,” the personality of her hedgehog, and how much time she spends interacting during the day whether or not she will like her hedgehog companion. Many hedgehog owners have hedgehogs that they snuggle with while they work. Even though the hedgehog may be sleeping, having a buddy may still be rewarding. Our hedgehogs do come out and eat during feeding time but most go back to sleeping. 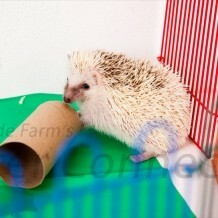 We have had many owners tell us that their hedgehogs develop a daytime routine. They do need consistency to help develop more daytime activity. I strongly suggest that you bring your wife to check out the hedgehogs before you buy one for her. That will help determine if a hedgehog is going to be a good fit. Over the past few years I have raised about 20 different species of small animals. The only one that comes to my mind as being active during the day is the degu. They can be quite interactive, but for the most part they are a caged pet versus a lap buddy and they do require stimulation to be active on a regular basis. I bought a hedgehog from you during the summer of 2010. She has been the perfect pet since then: no weight problems, runs on the wheel, very loving. Lately, she has stopped using her wheel completely, as far as I can tell, and her weight has definitely gone up. I just ordered the diet version of Spike’s Delite to try with her, and have also lowered the amount of food in her cage and the number of treats I give her. She is 2 1/2- is this behavior normal for this age? Her nails are clipped, she has no other gait problems as far as I can tell, and her mood has not changed. First, this is a great owner. 😉 She has checked all the obvious signs and given me lots of info to help her. Way to go!! My guess is she’s fine. As long as she is eating, drinking, and peeing and pooping normal amounts you should be good to go. Our guess is that she is getting older and putting on a little weight. There are a couple things you should check. Make sure the temperature is warm or even increase the current temperature to around 80° F. A visit to the vet wouldn’t hurt just to make sure everything is fine. You might try getting her a new wheel as she might have outgrown the one she has or it is uncomfortable. If you don’t have a Carolina Storm cake pan wheel that is what I’d recommend. They are easy for the hedgies to use and it could be better for her as she gets older. You might also give her some extra time out of the cage to observe her and how things are going. Are Hedgehogs Nocturnal, Crepuscular, or Diurnal?